Architect Tom lives in Edinburgh, with his partner David. Baking has always been a huge part of family life for Tom and his siblings, who were taught to bake by his mother June, a Home Economics teacher. The family cherishes recipe books passed down by grandparents from both sides of the family. As a true Scot, Tom can often be found making fresh shortbread to welcome friends and family into his home. When he’s not baking, Tom loves the great outdoors. He enjoys rugby, triathlons, marathons, skiing, horse riding, fresh water swimming and hiking as well as writing and photography. 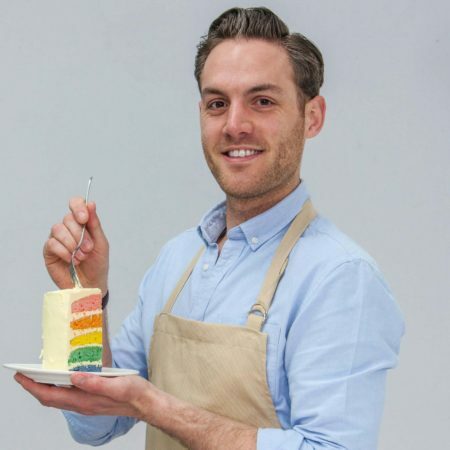 Go for gold with Tom’s Signature Fruity Cake from Cake Week. Using an entire pear as decoration shouldn’t work… but it does. A thousand of these coffee and amaretto kisses are never too much. Tom’s sandwich biscuit recipe is great for weekend baking.